The Museum of Ethnography in Budapest (the Néprajzi Múzeumin Hungarian), founded in 1872, is housed in a stunningly beautiful building in Kossuth Square, across from the Hungarian Parliament. It was built by the Austro-Hungarian professor and member of the Hungarian Academy of Sciences, Alajos Hauszmann, and historians of science and medicine are likely to find quite a few gems among its vast collection of artefacts related to Hungarian, European, Oceanian and African folk culture. 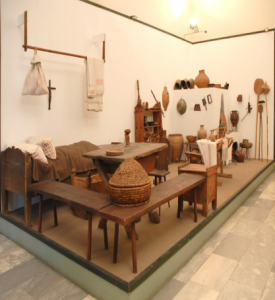 The Hungarian folk objects on display date from the 19th century up until World War II and comprise costumes, pottery, furniture, masks and magical objects. The entrance hall to the Museum of Ethnography, Budapest. By Jean-Pierre Dalbera. Image licensed under Creative Commons Attribution-ShareAlike 3.0. Unported license. 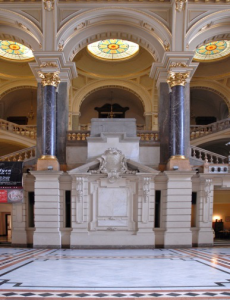 Although foreign-language audio tour guides are available, the Ethnography Museum in Budapest is not (yet) the professionally commercialised venue you will find in other European countries. The beauty of that is that the objects and their history speak for themselves and are not overburdened by historians’ interpretations. The downside is that the experts behind the scenes remain somewhat hidden. So, if you are interested in particular aspects or objects of the museum, it might well be worth to get in touch with the people at the museum before your visit. With the help of our Budapest tour guide and translator Ádám Mézes, a PhD in History of Medicine at the Central European University, we managed to arrange a meeting with Erika Koltay, an in-house expert on folk objects related to health and disease, who is well versed in some curious strands of Hungarian popular medicine with deep roots in the past. Traces of it are still found in cultural practices in rural villages in Hungary and Transylvania that she regularly visits to preserve the knowledge and related objects for the museum. A baked ring of bread (with flour provided by 9 different people in the village), for example, was/is used for a symbolic rebirth ritual in which a newborn infant is pushed through the ring to ‘clean’ it from potential future illnesses. To ‘throw out the baby with the bathwater’, to cite another example, used to contain a literal threat in Hungary: throwing out your baby’s bathwater after sundown meant an open invitation to witches to use said bathwater to harm or get hold of the child. 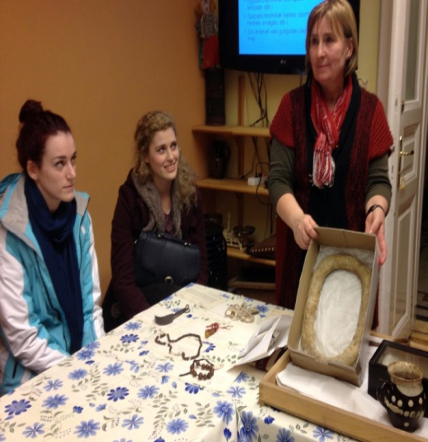 Erika Koltay, Ethnography Museum, showing a bread ring to our UCL History of Medicine IBSc students. By Carole Reeves. Some claim that these types of ‘contact magic’, based on the theory of sympathy, were introduced by Paracelsus whose wanderings brought him to Hungary in the early sixteenth-century, but the rituals are in fact much older. What is more interesting, although the original magical knowledge on which many such everyday cultural rituals are based has been largely forgotten by the majority of Hungarians, they are – albeit in a weaker form – strangely persistent in modern-day Hungarian society: hair and nail clippings are still thrown into the fire lest they be used by someone else for harmful magic against you, and wooden dolls to ‘take off’ the illness are still to be found in some rural households. Not to mention that there are still a few wise women in rural areas practising magical healing. Objects in the Museum of Ethnography, Budapest. By Jean-Pierre Dalbera. Image licensed under Creative Commons Attribution-ShareAlike 3.0. Unported license. Magic and folk traditions may appear contrary to science, but they also reveal knowledge that is making sense of the world just as science is. Even today, Hungarians appear to be more open to alternative medicine than in many other European countries; for some, scientific medicine and folk traditions often live side by side, complementing rather than opposing each other. Hence, learning about the history of cultural objects as found in the Museum of Ethnography is to glimpse a different way of understanding body and mind, health and disease. This entry was posted in Europe, Hungary and tagged Budapest, Museum of Ethnography, WWII by Stephanie Eichberg. Bookmark the permalink. The contributions to the BSHS travel guide website are based on annual excursions for UCL medical students doing an IBSc degree in History of Medicine that were organised and accompanied by Carole Reeves and myself during my Teaching Fellowship at UCL (Centre for the History of Medicine and the Science and Technology Studies Department). I am currently a Research Associate at the Centre for Literary and Cultural Studies (ZfL) in Berlin, working on the 'Neuro-Psychoanalysis: Neurosciences between Natural Science and Cultural Studies' -project.